European Commission President Jean-Claude Juncker, President of the European Council Donald Tusk and President of the European Parliament Antonio Tajani in Brussels. Although the leaders of the EU bloc were scheduled to discuss curbing migration from Libya and dealing with the aftermath of Britain's vote to leave the EU in Valletta, the Malta summit discusses the need for unity amid worries about Trump's commitment to the decades-old transatlantic partnership. Prior to this first leaders-level meeting since the new U.S. president took office, European Council President Donald Tusk expressed the extraordinary signs of concerns and ranked Trump along with Russia, China and Daesh as the biggest "threats" to the bloc in its past 60-year history. From his controversial break-up of the EU and dismissing NATO as "obsolete," Trump is barely able to open his mouth without ringing alarm bells in Europe. Trump caused huge anger in Brussels when he told German tabloid BILD that he has no issue with EU breaking apart. 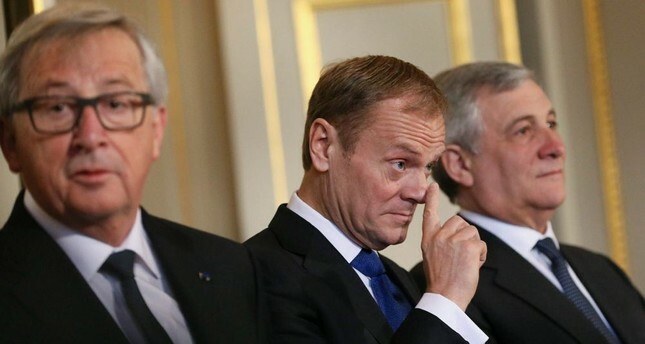 "Look, the EU was formed, partially, to beat the United States on trade, ok? So, I don't really care whether it's separate or together, to me it doesn't matter," he said. "Worrying declarations by the new American administration... make our future highly unpredictable," Tusk wrote in an almost apocalyptic letter to the EU leaders. The letter sets out the European Council chief's thoughts in relation to a debate on the "future of the EU" that 27 of the leaders, minus British Prime Minister Theresa May, will have in Malta. "The change in Washington puts the European Union in a difficult situation," Tusk wrote in his letter, urging EU leaders to take "spectacular steps" to boost European integration. Although some European governments were cautious that they should not be hasty to alienate a key ally, a majority sees that President Trump will keep his electoral promises, many of which are seen as absurd by Europeans. The atmosphere that the U.S. elections had created also brought up the question, "How will the eurosceptic circles be affected by Trump's presidency?" Some Europeans think public and political outrage on Trump in his second week in office may continue in the later months and this could also negatively affect the populist anti-EU groups in Europe. However, the stable continuation of the Trump administration is feared to boost already increasing support for eurosceptics. Speaking to Daily Sabah, Josef Janning, the head of the European Council on Foreign Relations' (ECFR) Berlin office, who is an expert on European foreign policy and transatlantic relations, agreed that Trump will continue to do what he said he would be doing. "He will be facing serious difficulties because his approach may not work as intended. The [Mexico border] wall will hardly solve the issue of illegal migration or will have unintended consequences such as breach of the North American Free Trade Agreement (NAFTA) clauses or World Trade Organization (WTO) rules," Janning said, adding that "Trump and his people" may not have thought through what the breakdown of NAFTA would do to the U.S. economy and that it could have a massive short-term impact. "On the WTO, the impact may be felt only later as arbitration takes a few years," Janning said. Tomas Zdechovsky, a member of the European Parliament from the Czech Republic, told Daily Sabah that Trump seemed very unpredictable, but the steps he has taken since the inauguration have clearly shown that he wants to keep his promises "even though they can be viewed as controversial." When asked to evaluate the tense atmosphere between the EU and Washington and if he is expecting any response to the new American administration at the EU Summit in Malta today, ECFR's Janning said, "Europe's best bet at this point is to wait and see. Very likely, more issues will arise as President Trump continues to act on his long-held views. He may suffer a defeat at home regarding immigration, but will likely differ with the EU on trade and on the role of NATO. With regard to both, Europe has nothing to win by moving first. Rather, the EU should try its best to stay united and not give in to the temptations to secure minor advantages in separate talks with Washington. This will be difficult enough, as most of the time there is sort of a rush to Washington in search of national benefits. Most U.S. administrations have been handed some 'divide and rule' potential by such behavior on the part of the Europeans." As for his thoughts on how eurosceptics will be affected by the Trump administration, Janning said European populists currently benefit from the Trump factor as it visualizes the potential of anti-establishment trends among the electorate. A conflict with European leaders also echoes statements from fringe parties about their country's weak leadership, he added. "However, the argument will run into difficulty when it comes to protectionist measures directed against European producers. Then, populists will have to choose between their populism and their nationalism. They will likely opt for a nationalist stance which could further weaken the EU as it would likely be directed against the EU single market as well, as is the Brexit decision. Unfortunately, it will take years for the public to discover that outside of a large market, protectionism does not work for small players. The U.K. will either be a very open economy outside of the EU or a weak one," Janning said. Meanwhile, Zdechovsky argues that regardless of who takes the presidency in Washington and despite all the disagreements, the EU must strive to achieve as good mutual transatlantic relations as possible. He also touched on the much debated populist trend in Europe and said that most Europeans have always been looking at Trump with distrust, thus the recent moves by Trump would neither change public opinion nor have a negative impact on the eurosceptic parties in Europe.